This marketing case study documents a communications campaign for hepatitis C awareness for NSW Health, by MediaCom. Hepatitis C is a significant concern in Australia due to the vast burden of illness, death and the potential for outbreaks and epidemic spread. It is a horrible illness and symptoms include depression, short-term memory loss, joint and muscle aches, as well as liver pain and permanent damage. Approximately 150 million people around the world have been infected with the hepatitis C virus (HCV), causing 350,000 to 500,000 deaths a year according to the World Health Organisation. No one wants to catch hep C and most people believe that only ‘junkies’ and those who share dirty needles are at risk. A key audience that had a misconception around hepatitis C is 18-24 year olds. In fact only 5% see themselves at any risk (Source: TNS for the New South Wales Government). In New South Wales, there is a need for more awareness and education on Hepatitis C for the general public. Greater awareness on the risks associated with Hepatitis C is expected to lead to a demand for services and expansion of laboratory capacity and clinical services, so that more people can be tested, treated and cured. MediaCom realised that educating a famously hard to reach target audience about a disease that most of them feel is irrelevant was not going to be easy, especially on a limited budget. To focus its limited resources, they focused on identifying the times and places where young people were most at risk of contracting hepatitis C.
After talking to health professions, hepatitis C sufferers and young people, MediaCom identified that an important risk setting was a party. In the midst of a good party, even people who were not regular drug users could get caught up in the heat of the moment and end up sharing a needle. The bottom line, as parties evolved, recreational drug use escalates and sometimes even the least likely people will do something stupid. This led MediaCom to its hepatitis C insight: the decisions that lead to infection are not always taken rationally. No one willingly contracts hepatitis C, so MediaCom concluded that there must be times when rational considerations were laid aside. Having identified parties as a key moment of potential infection, they decided to examine the dynamics of the decision-making process once the target had had a few drinks of alcohol. What was immediately clear was that their decision-making changed radically as the party developed. This led MediaCom to its clear insight: decisions that increase the risk of Hepatitis C are made in the heat-of-the-moment, not in a cold, considered state. For its message to be most impactful, MediaCom needed to reach consumers when they were in a heat-of-the-moment mindset. Unfortunately, you can’t buy media at parties so the question was, how can you get people into a drug-sampling-party-immersed mindset? MediaCom’s strategy had to put the target in harm’s way, to get them to consider that heat of the moment decision, but without risking their health. The solution was to do this by inviting them to a virtual party, taking advantage of the fact that 18-24-year olds were the heaviest internet users in Australia. online media and messaging inviting the target to attend. The party was entirely realistic, which allowed the target to attend with their friends and it would feature the sights and sounds they would have expected. The music included the hits they played at real parties and the venue looked just like any one of their mates’ houses. Due to the limited budget, MediaCom selected a single media partner to negotiate and deliver maximum paid messaging to drive consumers to this experience. By working with Mi9, MediaCom hoped to be able to secure maximum media inventory and advertorial coverage and ensure that more of the target group came to entertheparty.com.au. The party they created was realistic, interactive and appealing. Facebook integration ensured that the target could bring their friends along; a clear user journey through the party led them to the moment of decision. While the styling, music and location were authentically matched to reality, it created a party atmosphere the target audience wanted to go to and felt familiar in. The party-goer had to make decisions that started off fairly tame, like: do you want to hang with your friends in the kitchen or backyard? It then escalated to the more risky and hepatitis C relevant: do you want to get a home tattoo? It cumulated with a scene in a bedroom with the question: Would you share a needle? 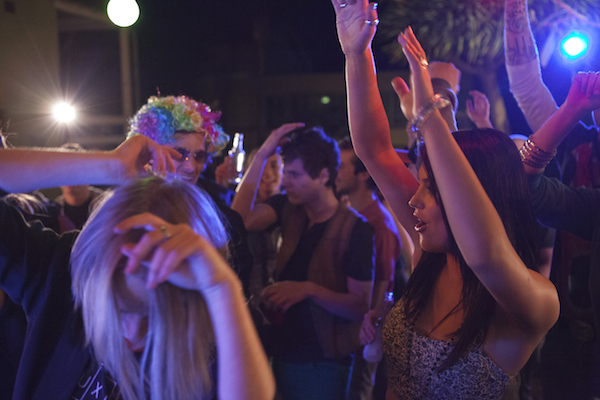 By gradually creating a heat-of-the-moment, late-stage party mindset, MediaCom was able to deliver its key message about the situations in which the viewer would personally be at risk of contracting hepatitis C. Once they had completed that journey, each party-goer could start again and explore different routes, or share the party with their friends on Facebook. The invite was targeted using paid and earned media. Banner ads were first person and featured real video shots of the party, as if you were looking right through the window of the house. They invited the target to ‘Enter the Party’. The Mi9 partnership enabled MediaCom to access relevant environments such as Zoo, Celebrity Fix, Music Fix, Cleo, Cosmo and behavioural targeting, which helped them identify even more young party-goers. 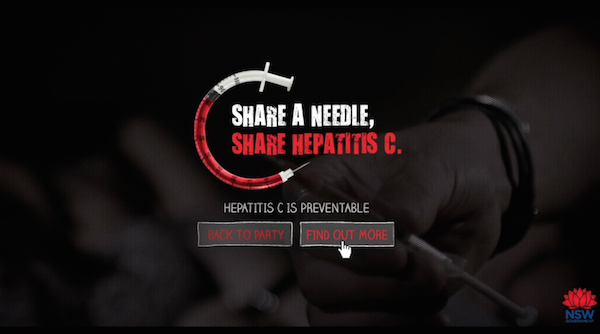 The ‘Enter the Party’ campaign has made Hepatitis C relevant to its audience. 27% of 18-24 year olds in New South Wales agreed with the statement ‘Hepatitis C is relevant to me’ after the activity compared to 5%, who viewed themselves as being at risk before the activity (Source: TNS for NSW Government Campaign Evaluation; January 2013). The communications reached a wide audience despite a tiny spend of just $200,000: 20% of 18-24 year olds in New South Wales participating in the evaluation research recalled seeing the communication (Source: TNS Campaign Evaluation; January 2013). MediaCom made specific messages stick: 69% of young people exposed to the party reported being more informed of the specific factors to contracting hepatitis C (Source: Millward Brown; October 2012). The team behind ‘Enter the Party’ created a relevant and memorable environment: 65% said they would refer to this campaign if a friend ever suggested the idea of injecting drugs. (Source: TNS Campaign Evaluation; January 2013).